A new change to Google Now on Tap began rolling out this week, one that should instantly turn it into a much more useful tool in almost any situation, because it gives you some control over what is being analyzed on the screen. Take a look at the screenshots above. Are you seeing the new addition? Yep, it’s the tap-to-select icon sandwiched in between the share and menu buttons. So how does this work? It’s pretty simple, yet enormously powerful. 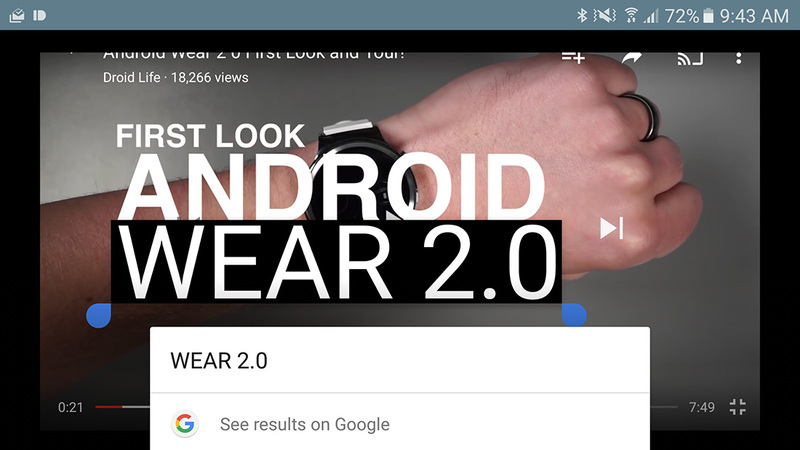 As you initiate a Google Now on Tap action, you get the initial screen analysis as you always do with Now on Tap. But should the results not come back with anything or show items you weren’t exactly looking for more information on, you can punch that tap-to-select icon before then selecting specific items of text. In the top set of screenshots, you can see that I initiated a Now on Tap action that brought up cards for Verizon, Motorola, and Google Nexus. But what if I wanted info on Marshmallow instead of any of those items? If I touch on that new tap-to-select button, Now on Tap does a quick processing of the screen (likely rendering all the text it can to make it touchable) which then allows me to specify that I wanted Marshmallow. 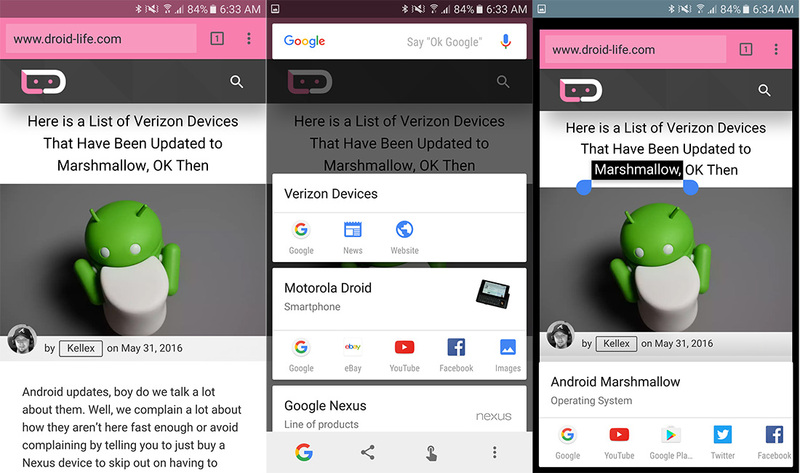 Once I tap on Marshmallow, it then redoes the Now on Tap analysis and brings me Marshmallow-related cards. Sweet, right? But wait, it gets better. Let’s say you aren’t in Chrome or an app where text is easily selected. Maybe you are in Twitter and you see an item that you’d like to search for, but isn’t exactly text. 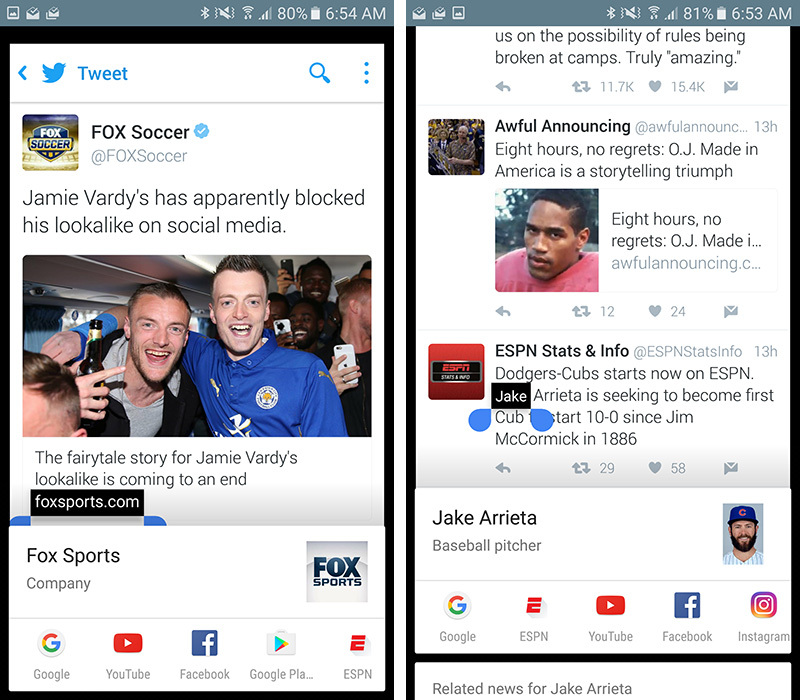 Like, in this example, I ran Google Now on Tap and then chose tap-to-select to highlight “foxsports.com” link to see results for FOX Sports. I also ran it on a page with a number of potential topics, but then narrowed that down to just the specific person I was looking for. Seriously, though, it gets even better. Let’s say I’m on Instagram, where you often see information that you want to know more about, but is an app that isn’t exactly friendly at sharing info to and from, largely in part because it’s image-heavy. Well, check this out. 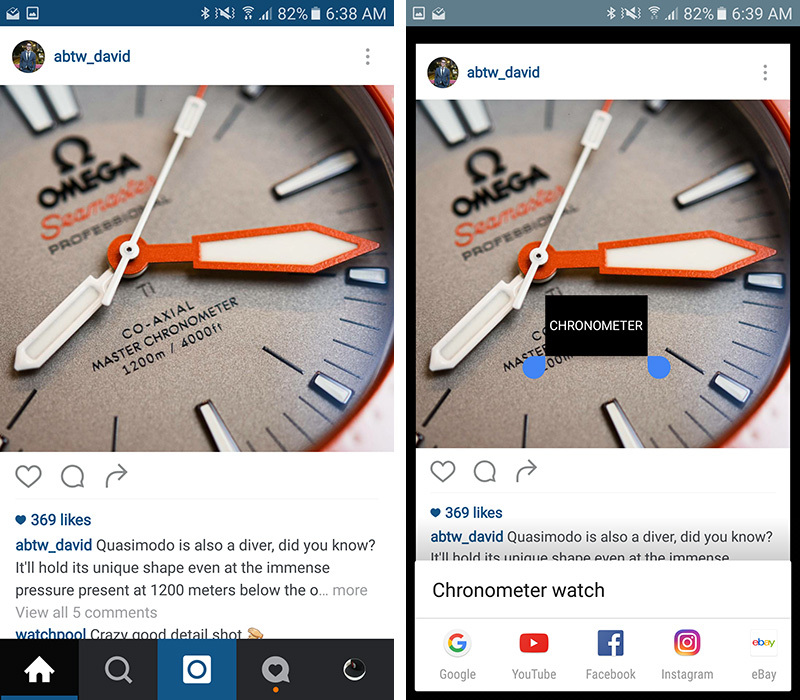 I found an image of an Omega Seamaster watch and ran the tap-to-select function in Now on Tap and it processed the angled wording on the watch face in the image to make it select-able. Whaaaaaaat! In order to get this functionality, you’ll need the latest version of the Google App, which might mean you’ll need the beta. For instructions on joining the beta, hit up this post. UPDATE: Oh look, it also works in videos. UPDATE 2: Now official! Should be rolling out to you today.